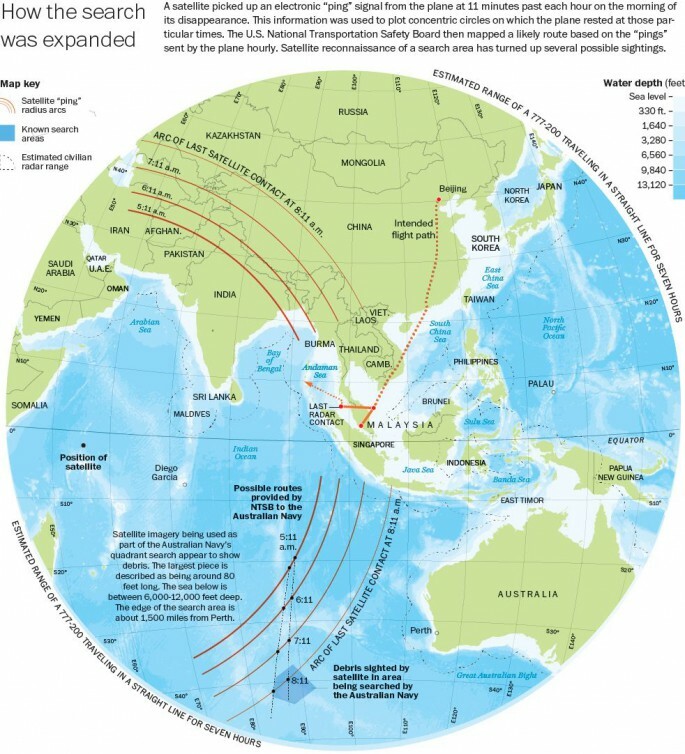 The chairman of Malaysia Airlines, Mohammad Nor Yusof, said today that, based on the new evidence announced by Malaysia’s prime minister yesterday, it had to be accepted that flight MH370 was lost in the southern Indian Ocean and no-one had survived. This, he said, was the painful reality. As he spoke to the press at Kuala Lumpur international airport, Chinese relatives of those on board the plane were marching through the streets of Beijing to the Malaysian embassy. They carried banners and chanted “We want the truth.” There were clashes with police. The Australian Maritime Safety Authority (AMSA) meanwhile called off all sea and air search operations for today because of adverse conditions. The search is a race against the clock as aircraft black boxes have a usual battery life of 30 days, and 40 days at the most. Despite an intensive multinational search about 2,500 kilometres southwest of Perth on Australia’s west coast, no plane wreckage has been found. He said the search was being conducted in an area where the ocean is 3,500 metres deep. In Beijing, relatives of MH370 passengers have accused Malaysia Airlines and the Malaysian government and military of delaying, distorting, and hiding the truth. The Chinese government is demanding to see the satellite data that led to the conclusion that the plane crashed in the southern Indian Ocean. There were scenes of extreme distress when relatives in Beijing heard that the Malaysian authorities believed the plane carrying their loved-ones had gone down in one of the most inaccessible areas of the planet. Flight MH370 disappeared more than two weeks ago with 227 passengers and 12 crew on board. Malaysia’s acting transport minister, Hishammuddin Hussein, today gave technical details about how the satellite company Inmarsat and Britain’s Air Accidents Investigation Branch reached the conclusion that MH370 had crashed in the southern Indian Ocean. 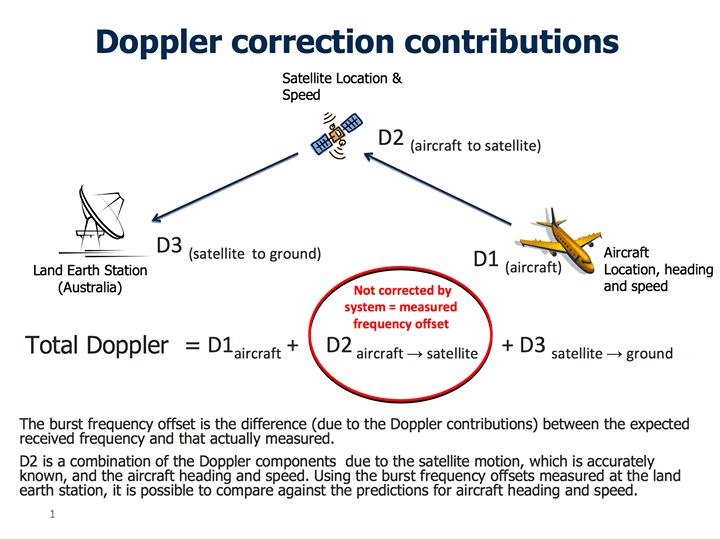 He said the experts considered the velocity of the aircraft relative to the satellite. “Depending on this relative movement, the frequency received and transmitted will differ from its normal value in much the same way that the sound of a passing car changes as it approaches and passes by. This is called the Doppler effect. The analysis showed poor correlation with the northern search corridor, but good correlation with the southern corridor. An international working group has been set up to study the satellite data further . One mystery is that there was an unexpected partial handshake between the aircraft and the ground station at 00.19 UTC. “At this time this transmission is not understood and is subject to further ongoing work,” Mr Hishammuddin said. No response was received from the aircraft at 01.15 UTC, which indicates that the aircraft was no longer logged on to the network. Mr Hishammuddin said the search had now been called off in the northern search corridor and the northern part of the southern corridor. Search teams, he said, are now covering 469,407 square nautical miles as compared with the 2.24 million square nautical miles announced on March 18. Mr Hishammuddin said the search operation remained a huge task but at least the search area was narrowing. “Whenever there is hope, even against hope, we wll do whatever it takes,” he said. Giving an operational update, Mr Hishammuddin said two Korean aircraft left Malaysia’s Subang airport for Perth this morning. Six Chinese ships, including an icebreaker, were in the search area and were expected to reach the last known position of MH370 by tomorrow morning. An American towed pinger locater – an instrument that can help find a black box – is due to arrive in Perth tomorrow. The system will be fitted onto the Australian ship Ocean Shield, which is due to dock in Perth on March 28 and arrive in the search area on April 5. Asked how he could say there were no survivors, the Malaysia Airlines CEO, Ahmad Jauhari Yahya, said the last known location of MH370 was in the middle of the southern Indian ocean. By then, he said, the aircraft was carrying very little fuel and there was no land mass nearby. The area was so remote that the possibility of anyone surviving for 17 or 18 days was also extremely remote. Malaysia Airlines (MAS) officials insisted today that their main concern is to care for the relatives. Mr Ahmad said MAS was now supporting more than 900 people, and in the last 72 hours had trained 40 additional care givers. The disappearance of the plane, the MAS chairman said, was an unprecedented event requiring an unprecedented response. It was sad and tragic for everyone at the airline. The investigation, he said, was still underway and may prove to be even longer and more complex than it has been so far. He said his heart broke at the unimaginable pain suffered by all the families and there were no words that could ease that pain. “Everyone in the Malaysia Airlines family is praying for the 239 souls on MH370 and for their loved-ones on this dark day. We extend our prayers and sincere condolences. Malaysia Airlines is battling to counter harsh criticism, not least about sending sms messages to the families ahead of the prime minister’s announcement yesterday evening. Mr Ahmad said the company’s sole and only motivation last night was to ensure in the incredibly short time available that the families heard the tragic news before the world did. The company was given just 30 minutes to inform relatives before Mr Najib’s announcement. Wherever humanly possible, he said, the airline spoke to relatives in person or by telephone, using sms messages as a last resort to ensure that nearly 1,000 family members heard the news from the airline and not from the media. He also said that 17 days after the plane’s disappearance, the announcement made last night was “a reality we must face and must now accept”. The MAS chairman countered accusations that the company had isolated the relatives of those on board MH370. The airline’s main concern, he said, was the families’ safety and privacy, and their access to care givers. Asked whether there had been a delay in providing information, he said “we shared their hope”. Hotel accommodation, transport, meals, and expenses are being provided for up to five family members per passenger. Financial assistance of 5,000 US dollars has been provided to next-of-kin for each passenger and the relatives may receive more money as the search goes on. Malaysia Airlines says it will organise for families to go to Australia once the investigating authorities give their approval. Australia’s defence minister said visa fees would be waived for relatives of those on board MH370 and Australia would welcome them and help bring them some closure. Malaysia Airlines officials are refusing to speculate about what happened to MH370 and how it ended up so far from its scheduled route from Kuala Lumpur to Beijing. Their focus now, they say, is to help relatives to move forward and to meet their legal and moral obligations to the families. Mr Ahmad said today that the airline was on tango alert and its processes and procedures had been ratcheted up to ensure the safety and security of its flights. The front pages of Malaysian papers were printed in black and white today in memory of those on board MH370. The New Straits Times simply stated “Goodnight, MH370” on its front page. The Star placed the names of all those on board inside the MH370 lettering on its front page. It was reported that the Petronas Twin Towers @ Live 2014 concert, scheduled to be held on March 28 and 29 has been cancelled out of respect for the passengers and crew of MH370 and their loved-ones. Reconnaissance aircraft and satellites have made various sightings of possible debris in the search area, but nothing has been located. The Australian Maritime Safety Authority said it had undertaken a risk assessment today and determined that the weather conditions would make any air and sea search activities hazardous and pose a risk to crew. Last night, HMAS Success attempted to locate objects sighted by an Australian Air Force P-3 Orion aircraft. Drift modelling was done, but the search team was unable to locate the objects. AMSA said that, in light of the statement by Malaysia’s prime minister, it offered its deepest sympathies to the families of the passengers and crew of flight MH370. Chris McLaughlin, senior vice-president for external affairs at Inmarsat, told the BBC that technology existed that enabled a plane to send off regular SMS-like messages giving time, speed, and distance – and cost just a dollar an hour. “Surely an aircraft should be reporting its position every 15 minutes,” he said. If aircraft were mandated to report their position in such a way, their location could be detected in an instant, McLaughlin said.